We made this fun Nativity Craft today! I found this cute idea on Family Fun! 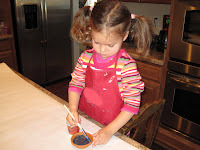 Paint the terra-cotta pots and saucer. Use a fine-point marker to draw faces on the wooden knobs. 2. 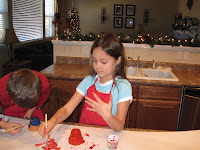 Once the paint is dry, turn the pots upside down and use tacky glue to attach a larger head to the bottom of each pot. When the glue is dry, drape a piece of fabric around the top of each head and tie it in place with embroidery floss. 3. Form a swaddling blanket from another piece of cloth, as shown, gluing it to secure the shape. Glue the small head to the blanket and set it in the saucer on a bed of raffia.